On November 8, 2013, Super Typhoon Haiyan pounded the Philippines. Heavy rains, waves that rose as high as 20 feet, and winds up to 195 mph made Haiyan the strongest storm to reach landfall in recorded history. Samaritan’s Purse responded in the immediate aftermath of the storm, helping storm victims with emergency food, water, shelter, and medical needs. In the next few weeks and months, we continued to work in hard-hit areas by providing clean water, shelter and latrine kits, nutrition programs, promoting hygiene and sanitation, and working with local churches to proclaim the hope of Jesus Christ. 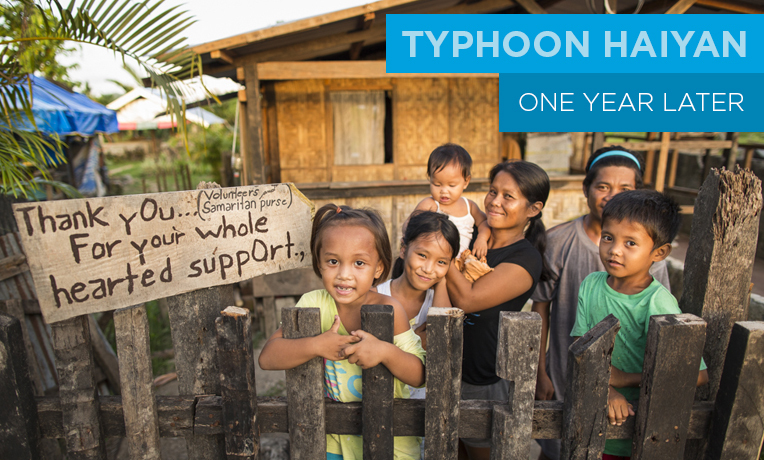 A year after the storm, we are still working to help the people in the Philippines recover from the devastating storm. Philippines Projects Samaritan's Purse is working to improve the quality of life for impoverished families in both rural and urban areas of the Philippines. We are training women and expectant mothers on best feeding practices for infants and young children. Our teams are providing clean water, latrines, and hygiene education. We’re also supporting families through livelihood projects such as community gardening and pig raising, as well as vocational skills and microenterprise training. Most importantly, our staff are sharing the Gospel. We partner with local churches to offer evangelism and discipleship courses so that they can reach their communities with the hope of Jesus Christ.